Too cold for a salad, you say? Not when you cover your greens in warm roasted veggies! Sweet roasted beets and carrots on a bed of spicy greens sprinkled with creamy goat cheese, toasted pine nuts and a lemon-juice dressing. But to be honest, I wasn't always a beet lover. In fact, I kind of hated beets until I tried this recipe from the Food Babe. It is so good I had to share it! My previous encounters had always been at the salad bar. Those pickled, gelatinous things made me feel like I was eating raw liver (not that I have tried raw liver). Despite this, I realllly wanted to get over myself and reap the benefits of beets (more on that below). So I'd chew and grimance, and grimance and chew. Until now that is! Roasting turned out to be the perfect way to transform beets into deliciously tender yet crisp versions on themselves. They look like glowing jewels of goodness for crying out loud! How could I not love them?! Rich in vitamins and minerals: Iron (carries oxygen to body), potassium (heart health), magnesium, fiber (digestive/colon health) and phosphorus; vitamins A, B & C; beta-carotene (eye & immune system health), beta-cyanine; folic acid. Beets are especially good for women (pregnacy & menstruation), because they help promote cell growth and replenish iron. Believed to be potent cancer fighter: That beautiful ruby red color that stains just about anything is thanks to a compound called betacyanin, which is believed to help prevent cancer. Blood purifier/Heart health: The folate and betaine in beets work together to reduce toxic levels of homocysteine, a natural amino acid that can harm blood vessels and contribute to the development of heart disease. 1. Preheat oven to 400F/200C. 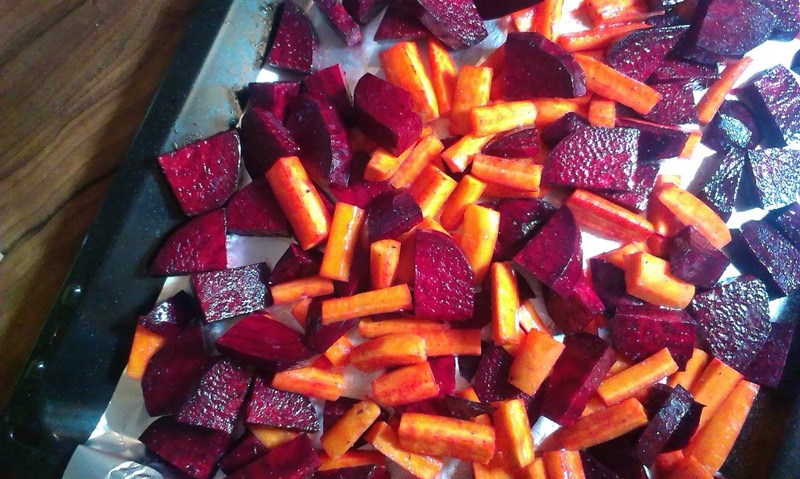 Toss beets and carrots in oil and season with salt and pepper to taste. 2. Bake for approx. 30 minutes, turning the veggies halfway. Remove and cool until they are just warm and no longer freakishly hot! 3. Mix dressing in a small bowl. 4. Spoon veggies on the salad greens, crumble in cheese and spinkle on nuts and dressing. Toss and serve.